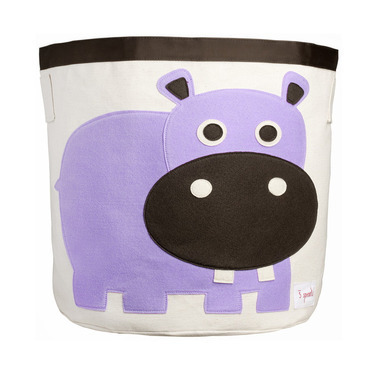 Help your kids clean up their act with this cute animal storage bin. Well sized for storing toys, books or laundry. Made of a cotton canvas this bin is tough enough to hold whatever you throw in it but cute enough to complement the best dressed home. A great space saver this bin folds easily away when not in use. The 3 Sprouts storage bin is a perfect gift for babies, toddlers and kids. Care instructions: Exterior - spot clean only. Interior - fully coated on the inside, each bin easily wipes clean using a damp sponge. Makes a great gift. Maintains it's shape really well. I love this toy bin. The bin is small enough that my 2.5 year old can move it if he needs to. I also think it is big enough to hold a decent number of stuffies. When it gets too full we select some stuffies that aren't being played with and give them to a younger sibling or donate them. Love the characters and the splash of color that add to room decor. This bin is larger than I expected. Looks durable & very well made. Very cute & appealing designs. My daughters' rooms were instantly transformed & neater. Bought some for gifts as well. Great product! This bin is huge! I like the fact that it folds flat as well. It's perfect for toy storage. Love this storage bin! Helps keep everything organized and its made of durable material. Really like the wipeable inside. Very strong material! Holds a lot. Great product. Perfect storage for the mega blocks that were occupying our laundry basket! I was looking for cute toy storage that wasn't hard like the traditional wooden toy box and came across the 3 Sprouts canvas storage bin. I love it! The size is great and it is super adorable in the nursery. Love these storage bins! this is the 3rd one I've bought. So great for toys. Well.ca has one of the best prices around for this product. Super cute storage bin for my daughter's room. Very well made. Cute product. Using it as a hamper also. Great product. Using as hamper. Love the lining and cute animals.